Horse is no doubt a noble creature and needs much love and care, just like any other living being. To let people investigate more about various horse breeds and learn how to provide them with proper care and nutrition, you may set up a horserelated website with intuitive interface and large skeuomorphic background images that trigger only positive emotions. People will easily find all they need thanks to a convenient navigation bar at the top of the page and wellorganized content blocks. They will see a rich gallery with photos of your horse club members, find informative descriptions under each album. It will help newcomers get closer to your business and arouse a desire to join your team. Once people subscribe to your news feed, they will be always informed about the upcoming events of your club, share your archives in social media, and thereby widen your customer base. 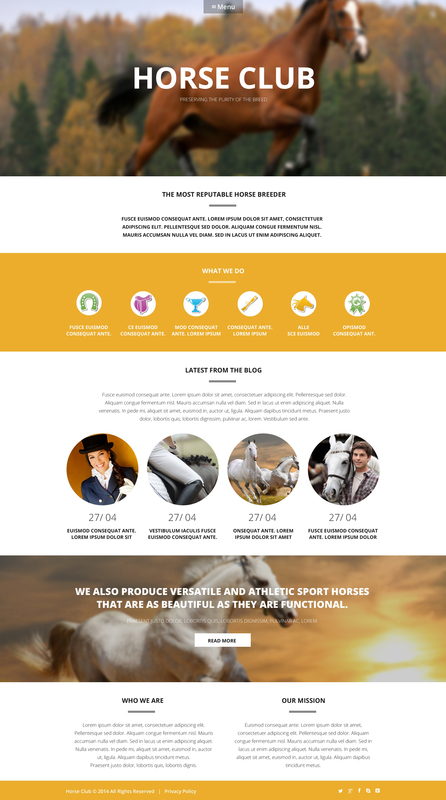 Pick this theme to build a professional site for your horse club. What am I allowed and not allowed to do with the WP templates for Horse Club? If you purchase the product at a â€˜Unique price' it guarantees that you are the first and the last person to buy this WordPress template for Equestrian Vet from us. It means that this template has not been sold before and you become an owner of a unique design. After this kind of purchase the template is being permanently removed from our sales directory and is never available to other customers again. The unique purchase license allows you to develop the unlimited number of projects based on this template, but the template should be customized differently for every project. If you purchase the product at a â€˜Buyout price' it guarantees that you are the last person to buy this template from us. It means that this WP theme for Equestrian Veterinarian may have been sold before a couple of times (see â€˜Downloads' number in item's properties) but only you and people who bought the template before you will own it. After this kind of purchase the template is being permanently removed from our sales directory and is never available to other customers again. The buyout purchase license allows you to develop the unlimited number of projects based on this template, but the template should be customized differently for every project.